Our Saturday afternoon soap making seminars focus on a different cold process soap making topic each afternoon they are offered. The seminars are facilitated from 1:00 to 4:00 pm and are usually scheduled for the first Saturday of each month. The afternoon topics we've selected address some of the most common questions we get from intermediate and advanced soapmakers, about what you need to transition to the next level of soap production that's right for you. 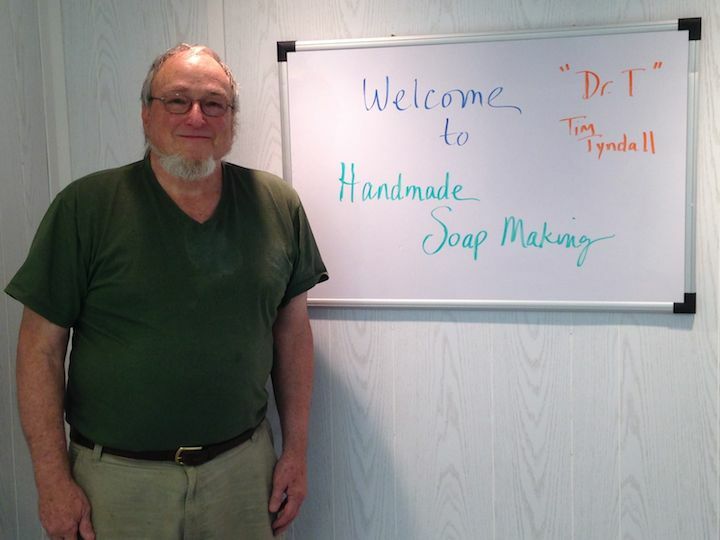 If you've taken a soapmaking class and have made a batch or two on your own, you're ready for these seminars. The format of our afternoons together are flexible to support you wherever you are in your soapmaking journey, and allow significant time for your questions. Bring your partner or a friend, and enjoy a day trip or weekend in the beautiful Blue Ridge mountains of western North Carolina. We're located just one hour northeast of Asheville and one hour south of Boone, NC. Put 179 Meadow View Road, Spruce Pine, NC 28777 in your GPS for specific directions. Our maximum number of participants for each Saturday Seminar is limited to six, so be sure to register early for the topics that interest you! We will be pulling our material from the outlines provided for our various one day or multiple day workshops on these topics, which are available for review here on our site. So we'll be prepared to teach on each topic, presenting information and fielding your questions, and also ready to facilitate discussions based on participants' experiences. We will adapt each Saturday Seminar based on the experience level of those who attend, and what is most helpful to you. You will receive a notebook with written material on each topic we cover, along with supplier information, recipes or resource links relevant to the topic that's addressed that day. If you choose any topic that involves active soapmaking, like "Large Batch Soap Making', then you'll want to dress in soap clothes so you can be involved! If our day will focus mainly on business issues or formulation, then you may dress as you choose: casual and comfortable is always best! Consider the season and check the weather forecast before you travel here for class: The Blue Ridge Mountains can get very hot & humid during the Summer, and extremely cold during the Winter months. Each Saturday afternoon workshop will start at 1:00 pm and end at 4:00 pm. Karen Wylie created The Soap Shed to sell soap wholesale, consignment, at craft shows, at their retail shops in the mountains and The Outer Banks of North Carolina, as well as from the soapshed.com website. She also coordinates production, quality control and packaging. Their unusual backgrounds - combined with their first hand experience in creating and running a handmade soap business for 20+ successful years - provide Tim and Karen with unique perspectives on making and selling handmade soap. You can register for this Workshop by putting it in your shopping cart and checking out here on soapshed.com. You may also pay by check or money order in the amount listed below and mailing it to The Soap Shed, 179 Meadow View Road, Spruce Pine, NC 28777.